Home » Food n Beverage » Nescafe » Nestle » purchase » Samsung » Sony » spend » WhatsApp » Peraduan NESCAFÉ Jom Muzik! Contest: Win Weekly Prize worth up to RM100,000! Peraduan NESCAFÉ Jom Muzik! Contest: Win Weekly Prize worth up to RM100,000! Buy any 2x NESCAFÉ UHT / can / PET to join this contest. Whatsapp the photo of the purchased receipt with your FULL NAME and MyKad number to 012 2033 711. 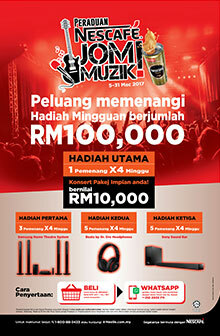 Visit Peraduan NESCAFÉ Jom Muzik! Contest terms & conditions for more details.